① Mince the onions and garlic. Crack the eggs into a bowl and beat them. In a separate bowl, mix the seasonings under “A” and set aside. ② Put a frying pan on medium heat, pour in half of the sesame oil, and add the garlic. 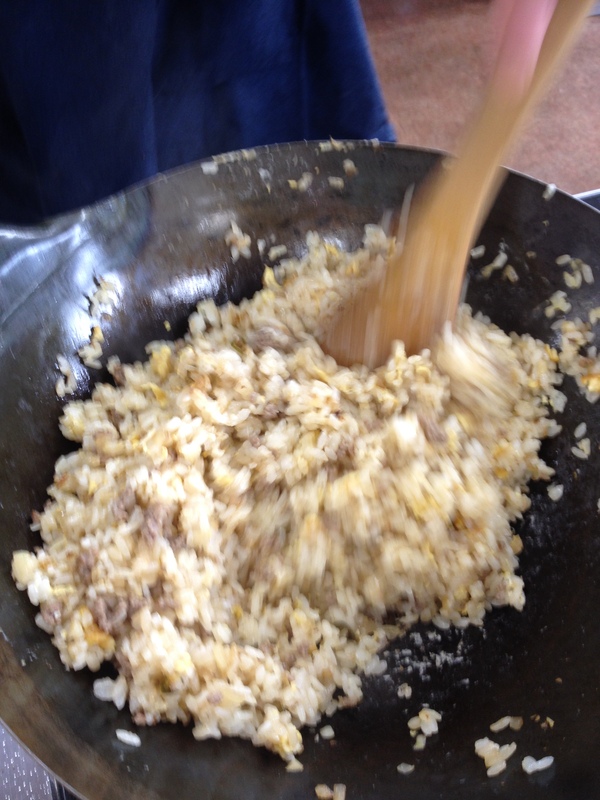 When you smell the aroma of the garlic, add the onions and ground pork/beef mixture, and fry. When the meat is fully cooked, remove it to a plate. ③ Add the rest of the sesame oil to the frying pan, allow it to come up to temperature, and then add the egg mixture and cooked rice one after another and stir-fry until you get the rice to breakup and combine with the egg. This should take only about 30 seconds or so. Now, add the ground meat and “A” seasonings. Continue stir-frying until the rice takes on a crumbly texture. Turn off the heat, add salt and pepper to taste, and serve.